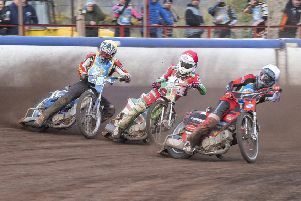 SHEFFIELD TIGERS haven’t lost at their Owlerton Stadium home since April – and they extended that long winning sequence by comfortably defeating Edinburgh Monarchs 51-39 in their Premier League speedway clash last night. The result, which scuppered the Capital outfit’s hopes of a fourth away win on the trot, moves the Tigers up to third place in the table and their play-off spot is all but secured. Monarchs’ aim of making a flying start to the meeting evaporated in the opening heat when Sheffield’s guest rider Brady Kurtz took the chequered flag, chopping across Craig Cook on the first bend which relegated the Englishman to third place. However, Justin Sedgmen finished second which earned Monarchs a 3-3 share of the spoils. But the Tigers bared their teeth for the first time in the second race when Josh Bates and Zach Watjknecht got the better of Rob Branford and Max Clegg in a helter-skelter four laps which gained the home side a 5-1 advantage to lead 8-4. But Cook gained quick revenge over Kurtz in heat four and, with Branford picking up a precious third-place point after closing the door twice on the chasing Bates, Monarchs grabbed a timely 4-2 to cut their arrears to just two points at 13-11. The Tigers then reopened a four-point lead in the sixth heat when Kurtz, aboard his spare bike, defeated Kevin Wolbert and, with his partner Paco Castagna finishing third, this 4-2 saw Monarchs fall behind 20-16 but the meeting was already on a knife-edge and some of the racing was out of the top drawer. The Tigers’ lively reserve star Bates grabbed his second win in three outings over Sedgmen in heat eight, overhauling the Australian on the third lap and, with Castagna providing the home side with another vital third-place finish, this 4-2 pushed the Tigers six points in front at 27-21. Monarchs’ tail-end duo of Branford and Clegg were having a torrid time and, with No.1 Cook winning just one of his first three rides, the Tigers were starting to build up a degree of momentum in front of a big home crowd. With the ninth heat shared after Sedgmen defeated Frenchman David Bellego, Monarchs remained six points behind and were discovering just how difficult it is against the Tigers in their own den. Kurtz was proving an inspirational choice of guest for the Tigers after defeating Erik Riss for his third victory in four starts in heat ten, which yielded yet another 4-2 verdict for the home side, who now had eight points in hand at 34-26. Wolbert surprisingly had a shocker of a race and tailed off at the back which was something of a blow for the Monarchs. Then Sedgmen ran a last place in the next race which negated the win Cook pulled off over Bellego. A share of the spoils was no use to Monarchs at this point in the match as they battled to get back into contention. And the Tigers really turned the screw in heat 12 when Bates and Bellego extracted their side’s second 5-1 advantage of the evening over Branford and Wolbert, the latter trailing in last once again. Sheffield were breathing fresh air as they led 42-30 and had the smell of victory in their nostrils. A fourth victory for Kurtz in heat 13 against Riss and Cook clinched the match for the Tigers, who maintained their big 12-point lead – 45-33 – with just two heats remaining. Riss triumphed for Monarchs in the penultimate race but unfortunately it had no bearing on the eventual outcome. But Kurtz rounded off his night in style with his fifth race win of the match against Cook and Sedgmen in heat 15 for a 51-39 victory. Sheffield: Kurtz 17, Bates 12, Klindt 10, Bellego 7, Castagna 3, Watjknecht 2. Monarchs: Cook 11, Sedgmen 10, Riss 8, Wolbert 7, Branford 2, Clegg 1.